Bill was born and bred in Adelaide before moving to Brisbane after leaving school. Bill graduated from the University of Queensland in 1981. He practiced in South Australia for a year before moving to the Southern Highlands to work with Allan Chittick in large animal practice. Bill became a partner in the practice in 1988. Special interests include cattle, horse and alpaca medicine and surgery. Bill was a foundation member of the Australian Alpaca Vets Association. He was an Honorary vet for the Sydney Royal Easter Show for 18 years. He is a former president of the Bong Bong Picnic Race Club and a committee member for the last 24 years. 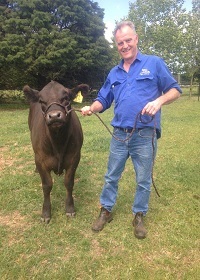 He is also an honorary vet for the Robertson, Moss Vale and Bowral Shows. Bill is an AQIS accredited vet for large animal export, accredited for the JD MAP scheme and an examiner for the National Cattle Pregnancy Scheme.